Witchfinder General is one of those films we get into fights over who gets to review it here, so revered is the film. One of only four films directed by the late Michael Reeves, who died at the criminally young age of just 25, Witchfinder General is a dark and multi-layered portrait of true-life witchhunter who killed the innocent the name of Christianity, and features at its centre what Vincent Price regarded as the finest performance of his career. Who are we to argue? 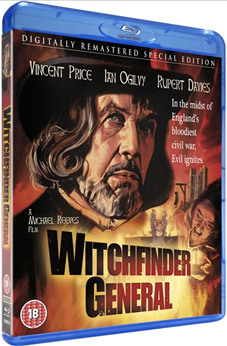 Now Witchfinder General has been digitally remastered and is to get a UK Blu-ray release from Odeon Entertainment on 13th June 2011 at the RRP of £22.99.